Spring has brought a topsy-turvy spell of weather to our home in Paonia, Colorado. At the beginning of the week, it was in the 70s, and we were working on our tans, but the following days brought hail, snow and ice that threatened the valley’s budding fruit trees. The erratic weather comes against the backdrop of a bleak water outlook for the Colorado River. Many in the Southwest are likely to be sweating this summer. 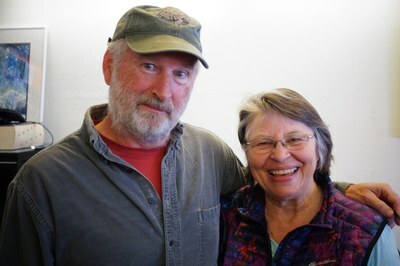 Longtime-subscribers Jeff Brack and Gretchen Long stopped in for a quick tour after a 10-day camp trip in Utah. Meanwhile, Executive Director Paul Larmer, Contributing Editor Cally Carswell and Board Member Luis Torres met with a small group of HCN readers in Santa Fe in March. Chief among the topics was civic discourse: In an age of information overload, how do we get more people to exercise their basic rights as citizens? Susan Martin, who works for the local Sierra Club office, said her experience canvassing voters has given her a clue: Don’t use politicized buzzwords, and focus on the practical ways issues manifest in people’s lives. 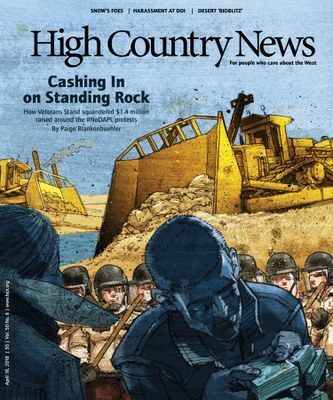 Corrections: Due to a reporting error in “Cashing in on Standing Rock” (HCN 4/16/2018) we erroneously claimed that Michael Wood, using donations to Veterans Stand, paid $65,000 to WorldViz for virtual reality services for the Vans Warped Tour in June 2017. We have verified that although Veterans Stand corresponded with WorldViz, no contract was signed and no payments were made. Additionally, we made some errors in presenting the timeline of Veterans Stand and Standing Rock. President Barack Obama on Nov. 1, 2016, announced that the Army Corp was reevalauting the path of the Dakota Access Pipeline, and he denied a crucial easement on Dec. 4, the same day that many Veteran Stand volunteers arrived, not the next day. The article has been updated to include that 300 people were injured and 26 were hospitalized following a clash with the Morton County Sheriff’s Department, and that local law enforcement disputes the nature of Sophia Wilansky’s arm injury. Michael Wood moved to Playa Vista in the spring of 2017, and it was Anthony Diggs, not Wood, who eventually abandoned the Vans Warped Tour. A caption in our April 16 Research Fund book review incorrectly stated the year by which musk oxen were nearly eliminated from Alaska: It was 1900. We regret the errors.